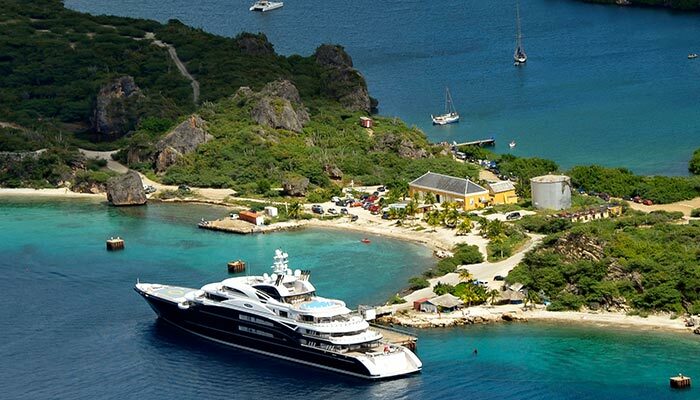 Most yachts visiting Curaçao, anchor in the large, safe and naturally sheltered Spanish Water Bay. The bay area offers a range of facilities and other conveniences. Curaçao furthermore offers excellent boatyard facilities. Docking in the St. Anna Bay, at the Handelskade or the Mathey Wharf, is possible upon special request. Requests must be directed to the Harbor Master. Curaçao Dry-Dock offers facilities for repairs and dry dockage. Yachts can stay for a maximum of 6 months (only with crew). Foreign crew can stay for a maximum of 180 days. Carving of the official number must take place under supervision of an official from the shipping administration or a surveyor from one of the classification societies. Application for a permanent registration certificate can be made when the carving has been completed. Call-signs are issued together with the (provisional) Certificate of Registry. For more information, contact the CPO offices.